Navan tapestry atist Krystyna Sadej founded the Navan Fine Arts Exhibition Sale, its first show in June 2011 in celebration of Navan's 150th anniversary, and chaired by then resident Christina Pleizier. This annual event features fine arts including paintings, pottery, textiles, woven goods, garden art, wood art and more. All art is original and made by the artist, and artists are accepted by a juried process only. The show has continued each year since, and organized by a cooperative group of artists based in Navan and surrounding villages. This group is known as the Navan Fine Arts Group. The Navan Fine Arts Group is a volunteer cooperative of area fine artists. In addition to the annual show, we have been involved in several events in Navan, including a mini art gallery at Country Moments Spa & Wellness Centre, and an Annual Wine & Art Pairings event at Domaine Perrault in partnership with the Navan Women's Institute. 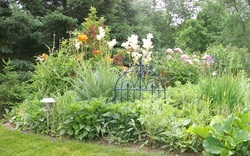 In 2010, the Navan Women's Institute decided to invite artists into the gardens of its garden tour. The tour is held every year or two (or sometimes three) in and around Navan and is a fundraiser for bursaries given to post secondary students. The 2015 tour featured 8 homes, with local artists exhibiting and selling paintings, garden décor, jewelry, pottery, and more. Deavy’s garage on Colonial in Navan was painted and decorated in 2001 prior to the 2001 International Plowing Match held here. The garage was owned by Herb Deavy, and now his son Andrew. The project was organized by Navan-resident Sheila Minogue-Calver. She recruited 12 kids from the Village who helped clean the garage, wearing yellow plastic aprons and rubber gloves for protection, then paint it using a borrowed spray gun. Cleaner products and paints were provided by Sico. Local artist Heather Vos – who was also part of the first Navan Fine Arts Exhibition & Sale in 2011 - painted the scene on the garage, including the little black poodle who belonged to garage owner Andrew Deavy. Eight artists exhibited their works at Domaine Perrault Winery in September of 2014 and 12 in 2015 and 2016. The Navan Women's Institute sold tickets for wine tastings plus hors d'oeuvres, as a fundraiser for post-secondary bursaries for local students.The ambience was wonderful and the pairing of art with a wine event was perfect. The very first craft sale in Navan was held in 1978 at St Mary’s Church Hall on the third weekend in November. Participants were a group of artists and crafts persons who lived in the local community. This juried show moved to the Navan Memorial Arena when it opened, and has continued each November ever since. The group is known as the Navan Arts & Crafts Group, and has no affiliation with the Navan Fine Arts Group. For more info on the Navan Arts & Crafts Group, visit their Facebook page. Of the original group of Artisans Doreen Hardiman still exhibits today, and is a member of the Navan Fine Arts Exhibition & Sale. The Capital Artisans Guild started from the Navan group in 1982 as the number of artists grew. Artists from the Orleans area - the half that was in the former Cumberland Township - were unable to join the Gloucester Arts Guild as one had to live within the boundaries of what was then the City of Ottawa. It made sense for a new guild to be formed and was known as the Cumberland Arts & Crafts Guild. They held their shown at Sir Wilfred Laurier High School on Tenth Line, a few of the shows may have been held at the Navan Arena in the Guild's early days. Since amalgamation all the guilds have opened their membership to areas even beyond the city's new boundaries. The Cumberland guild then changed their name to the Capital Artisans Guild to reflect the much larger area that it now represents.